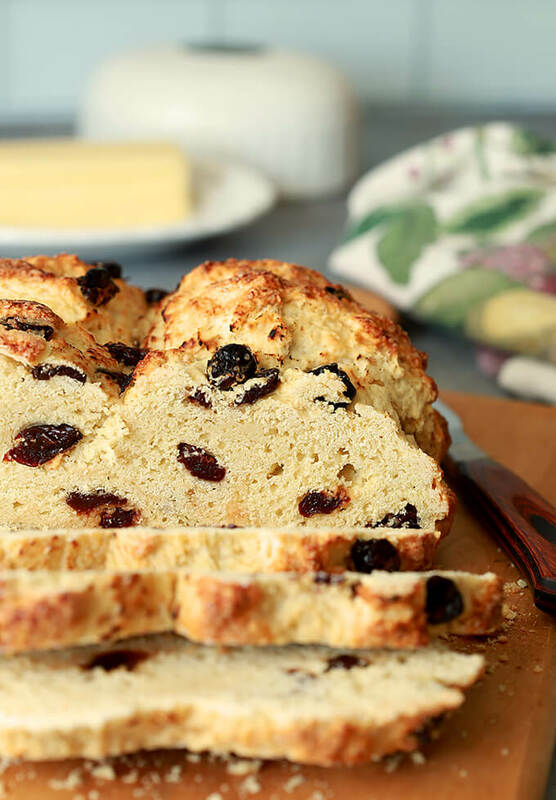 Not just for St. Patrick’s Day, Irish Soda Bread with Tart Cherries is great all year round. Baking soda makes it rise and there is no kneading or waiting! I have a smidgeon of Irish blood or at least I think I do. My maternal grandfather died when I was very young so I have only one recollection of him and while I’ve heard he was Irish and English I have no proof of that. My niece is doing one of those DNA tests…guess we’ll find out soon! Still, for the moment I’m sticking with it and as a result I celebrated St. Paddy’s Day with neighbors and made my version of an Irish dinner. Because I am at most 1/8 Irish, I took great liberty with the dishes I made. I’ll be sharing my Chili Pie (like Shepherd’s Pie but with Chili and Guinness topped with potatoes) soon but today simply HAD to get this recipe to you. It was absolutely perfect. 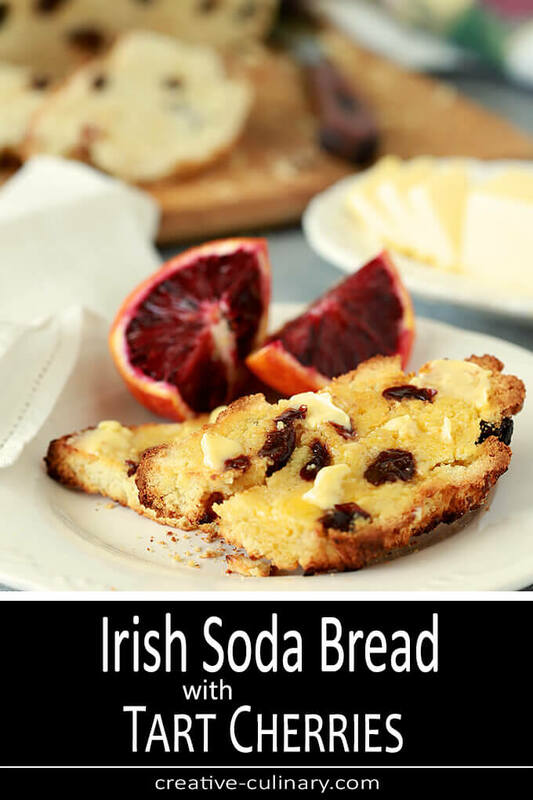 I was initially inspired to make Irish Soda Bread after sampling some at Sprouts Farmers Market last week. Sampling some and then buying two loaves that is! It was unexpected…and sweet. I know I’ve had savory versions but none of them quite hit the mark like their sweeter version. Loaded with raisins and liberally topped with large grain sugar, I just loved it. 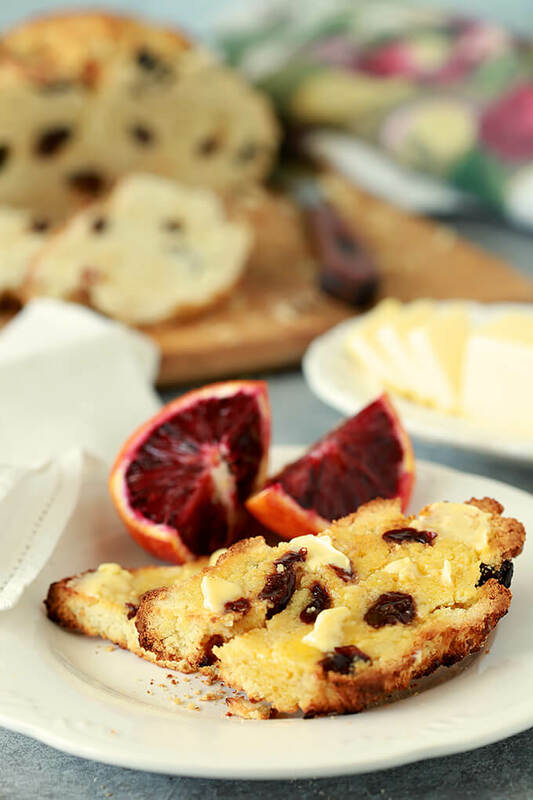 When I mentioned to a friend I wanted to make some, she shared her absolute love for the sweet version on her blog; albeit without raisins or the sugar on top. Worked for me and with some slight modifications on my part rivaled what I had brought home from Sprouts. Wait, not rivaled…was even better. The ease of this bread is a big part of the beauty. Baking soda is the leavening agent instead of yeast so there is no need for kneading or waiting for it to rise. My kind of bread for sure! I wanted to further mimic Sprouts though so I headed to the pantry for raisins…and had none. I had just purchased these Tart Montmorency Cherries cherries at Costco and could see no harm in this substitution; loved them so much more than raisins. The other thing Sprouts did was to cover the top and sides with a large grain sugar. While their sugar appeared to be a white granulated sugar, I pulled out the Demerara Sugar I always have in the pantry for my coffee and used it. I don’t think the extra sweetness was required so don’t pile it on too thick, it’s that slight crunch on top that makes it extra special. What did my company think? They thought they needed two slices each and then the ten year old twin girls gave me that look. I know that look well; it read all over their face, ‘Can we take some home with us?’ As much as I loved this bread, I love them more and sent a big chunk home. This recipe makes a big loaf of bread and supposedly serves 20. Haha…no way was anyone eating only one-half slice but it sure made enough that five of us had it with dinner and even after parting with some I still had a couple of slices left for my breakfast the next day. I’m going to suggest you really treat yourself and try it with Kerrygold Irish Butter too. Amazing. I have to make this again…and certainly will not wait until March 17th of next year. This is going to be a regular rotation in my kitchen and I’ve already made a 2nd variation that I’ll share soon…one made with Guinness, oatmeal, brown sugar and some orange zest. If I hadn’t messed up royally and forgotten the butter (!) I would offer it up on Monday…but I need to make it again and review it with ALL the ingredients. Oops. 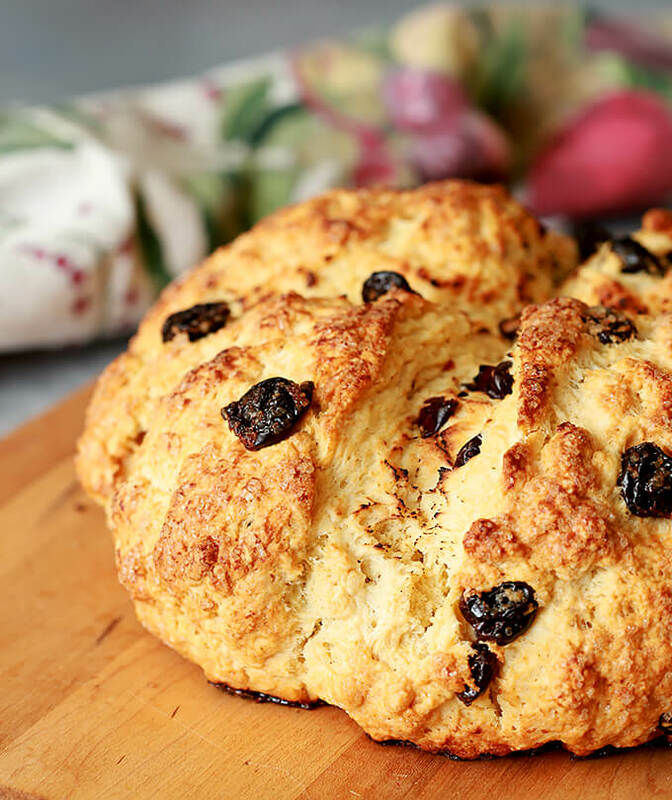 Try Irish Soda Bread with Cherries next time; it’s delicious! A sweet and easy to make bread that uses baking soda for leavening...so just a touch of kneading and no waiting! Perfect with dried fruit and a finish with demerara sugar on top. In a food processor (see Notes to use a mixing bowl), combine the flour, sugar, baking soda, baking powder and salt. Process until the butter is incorporated with the dry ingredients. Put into a mixing bowl. Add the dried cherries and mix to coat with dry ingredients. Combine the buttermilk and egg in a measuring cup or bowl and whisk to combine. Pour into the flour mixture and stir to combine all ingredients. Turn the dough out onto a lightly floured surface and knead slightly. The dough should not be sticky; add a bit of flour if necessary if it is. Form the dough into a round and place on a baking sheet lined with parchment paper. In a small bowl, combine the 2 Tablespoons of melted butter and buttermilk and brush onto the dough. Using a knife, cut an cross mark into the top of the loaf. Sprinkle the top with the demerara sugar and bake for 45 minutes or until a toothpick inserted in the center comes out clean. Buttermilk - most buttermilk in the grocery store is simply cultured milk so I make so I simply make my own version which adds an acid to regular milk to get a result. For one cup milk, start with juice from half a lemon. Mix the lemon with the milk and wait a couple of minutes; the milk should thicken; if not add the juice from the 2nd lemon half and mix; allow to thicken before adding to the recipe. Dried, tart cherries - Irish Soda Bread often includes raisins but can be made without any fruit; use what you prefer. Mixing without a food processor - Put the dry ingredients into a bowl and cut in the butter using a pastry cutter or fork or grate the butter on a large box grater and gently work it into the flour until incorporated. I make chili pie sometimes! Not with Guinness, though — look forward to seeing that recipe. 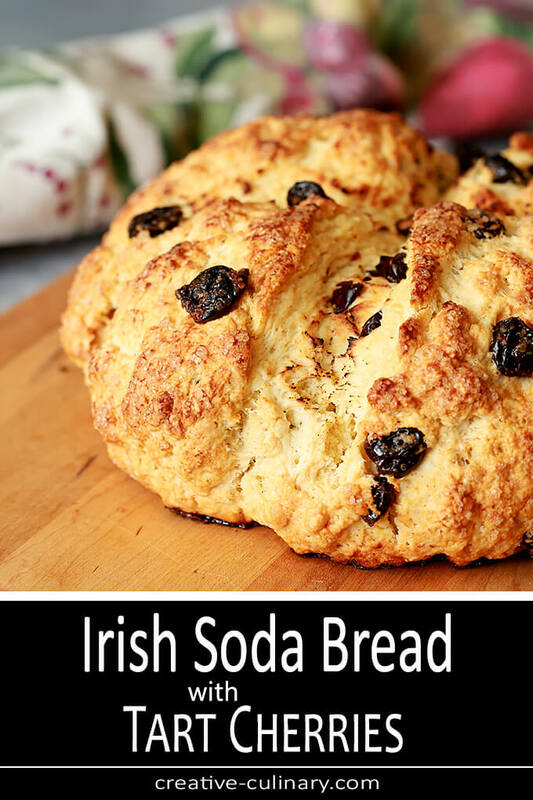 And look forward to making this one — love soda bread, and this one looks more moist than dry (too many soda breads are on the dry side; or maybe that’s just my taste). Good stuff — thanks. That’s one reason I think it never appealed to me they always looked so dry. I started checking early and doing that knocking business for that sound of hollow and for me just about exactly the 45 minutes in the recipe. You know what it reminds me of? Sweet drop biscuits with that kind of crusty exterior and then a softer interior but I make when I’m serving Strawberry Shortcake. With a little bit of sugar in it and cherries? It was so good! Like your soda bread, But I hate cherries. So I use dried cranberries instead. Recipe as follows: 4 cups ap flour, 1 tsp baking soda, 1 tsp baking powder, 1 tsp salt, 1/2 cup sugar, 2-eggs, 2 cup butter milk, 2 tbsp melted butter, Mix the first 5 ingredients , beat eggs and butter milk and melted butter. blend well and on place on a sheet of parchment paper in a roasting pan. Bake 350 for about 55 minutes. I place the loaf on cooling rack and cover with a clean dish cloth so the crust stays some what soft. Try it you may like it! Definitely why I suggested using what you like. Some people don’t want any fruit but I’ve been thinking about trying even others including apricots and yes cranberries too! For the same amount of flour that I used the recipe you provided has so much more liquid. It’s not soupy? No not at all, it has always came out great. I have to make it at least once a month or the family gets a little crazy. There is never any left over after 2 days. Made me chuckle…homemade bread always disappears here too!